Australia used to be England’s penal colony. Now that the one fact everyone knows about Australia is out of the way, let us proceed. They were actually discovered by the Dutch in 1606, but Captain Cook was the first to make contact with the eastern coastline in 1770, which is when the British claimed it. They became a dominion in 1901 which left England with nominal authority but really meant that they governed themselves. Following their involvement in World War I, a sense of national identity began to solidify. A recent hot button issue (that it seems Americans feel like they have the monopoly on) is that of immigration. It has become more and more difficult to secure visas and ultimately relocate to this large island country. As it does to the past policies of the U.S., this runs counter to Australian history as well. The national anthem even contains the lyrics, “For those who’ve come across the seas, we’ve boundless plains to share, with courage let us all combine to advance Australia fair”. I imagine we would also have significant confliction if the Star-Spangled Banner contained a passage regarding opening our borders. The fact that this topic is so heatedly debated, and so many want to live there, just indicates the opportunities and high quality of life Australia has to offer. Their cuisine has a heavy influence of fowl as well as coastal seafood. With their nearly endless grazing fields however, lamb is truly the culinary gem. Australia produces the second highest amount of lamb by any country in the world, and more than their neighbor New Zealand who is known for it. With the Ohio State Fair recently open, there was an abundance of lamb to be had so it was a logical choice. I went with a simple recipe from Meat & Livestock Australia themselves. A nice sugary marinade allowed the lamb to caramelize deliciously. Grilling would also be a good way to cook the meat, but I did mine on the stove in a very hot pan. The sweet was offset by the sour from honey mustard, Worcestershire, and lemon juice. I was surprised when the side dish of rosemary carrots almost stole the show from the main course. 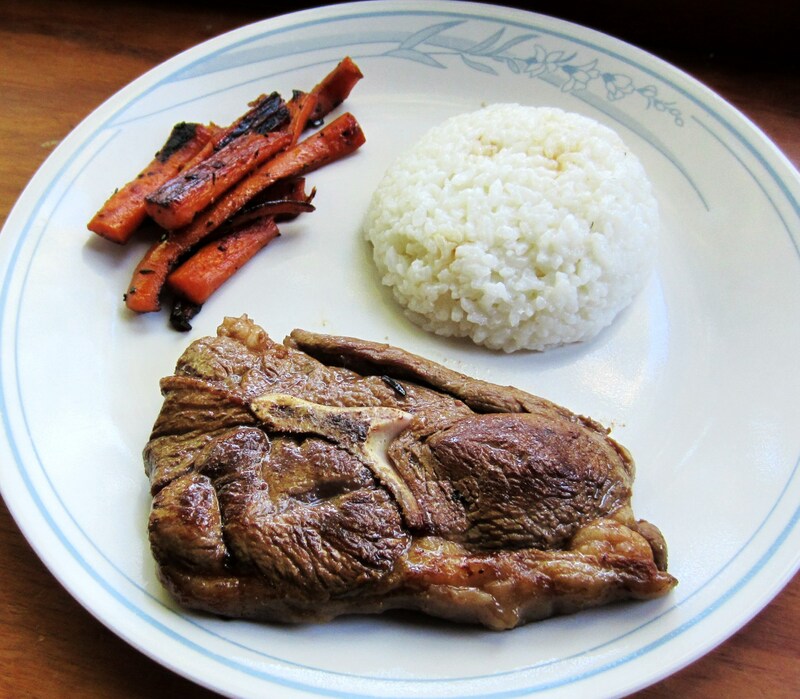 The slight acidity of the carrot glaze again played nicely off of the lip-smacking lamb. Sometimes I play it loose with certain spice or herbs based on what I have, which I am not always proud of. However, this is one case where fresh rosemary was absolutely necessary, no compromises. There is nothing that could have made this dish faster to prepare or tastier to eat. Next we do some country math: Australia – al = Austria. Combine the marinade ingredients in bowl and brush over all sides of the lamb chops. Cover and refrigerate for at least 30 minutes for flavors to infuse. Drain excess marinade and cook lamb on medium high heat, turning frequently, about 10-12 minutes for medium or until cooked as desired. Transfer to a plate, cover with foil and let stand for 5 minutes before serving. To prepare the carrots, place all ingredients in plastic bag and toss. Saute until carrots are cooked or wrap in foil and place on the grill, turning pouch occasionally until carrots are cooked as desired. Most of the time I feel pretty smart. A bit cocky but true nonetheless, and I enjoy that feeling. Other times, I feel like an idiot. And there are those rare times when I feel bad about being an idiot…this is one of those times. As Jews, and for good reason, I get the sense that we often feel like we have the monopoly on genocide angst. We spend so much time ruminating on our history that it can often make us belittle other events in the world. So it was a shock to me to learn that there was an earlier genocide in the 20th century, when the Ottoman Empire systematically killed 1 – 1.5 million Armenians in 1915. Why? Vaguely because Armenia historically had close ties to the West due to their overwhelming Christian population dating back over a millennia. Didn’t know Armenians were mostly Christian? Me either. Ever wonder why the four quarters of Jerusalem are: Jewish, Muslim, Christian, and Armenian? Well now we know. In addition, they were thought to be too friendly with Russia whom the Turks were constantly at odds with. It didn’t hurt that the Ottoman Empire had also signed a secret alliance with Germany in 1914 which once again put them at odds with the Russians. But in all honesty, it just seems like the Arab empire wanted an excuse to cleanse one of the only large Christian populations in the area (Armenia is landlocked and surrounded on three of its sides by Turkey, Iran, and Azerbaijan). In any event, this lead to the Armenian Diaspora which continues to this day. Diasporas can have strange effects on cuisine. When a people are forced to move, their food culture is one of the few things they can easily take with them. This can often strengthen the reliance on a shared culinary community to hold on to their identity. Another side effect is that the new area they are in may not have the same resources as where they left. One example would be chicken-fried steak in the Texas. This is the adaptation of German wiener schnitzel but using the available beef instead of pork or veal that would have traditionally been used. I wanted to find a dish that really represented Armenian food. I made a three part meal as it was pretty simple and easy to assemble. The first part was the main course, a tomato based lamb dish that had a really nice sweet flavor. The starting base of green peppers and onions really brought out the meatiness of the lamb (beef would also work). 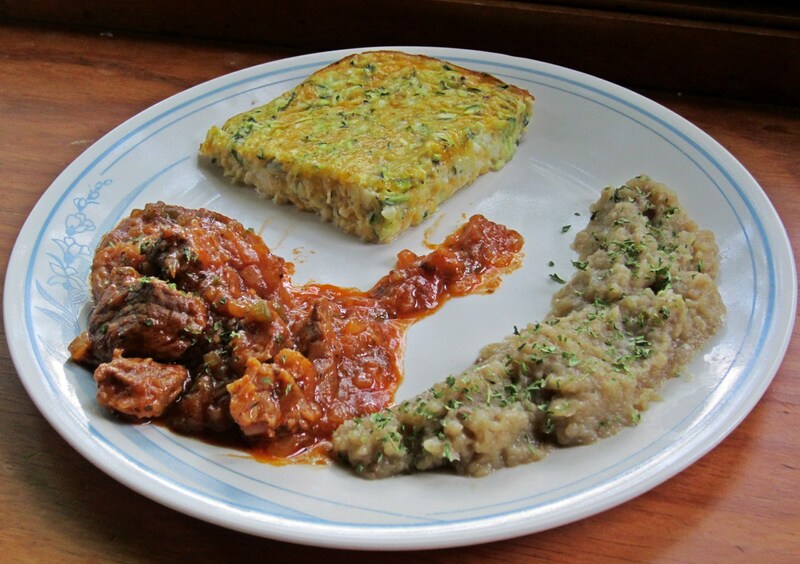 One side I did was a basic mashed eggplant. This turned out well but was a little bland on its own. When mixed with the sauce from the lamb however, it took on new life and was very delicious. 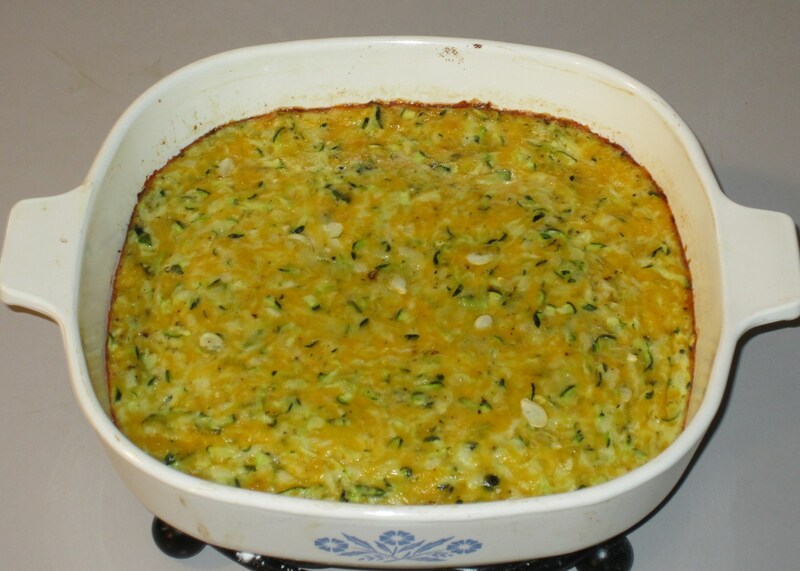 To finish I made what amounted to a zucchini quiche with sharp cheddar cheese. This was very savory and I kept having to remind myself it wasn’t a spinach quiche, but zucchini with its own unique flavor. The only thing I would change is making sure I got all the seeds of the zucchini (it was freshly grown, not from the grocery which meant the seeds were larger and heartier). Overall this was a nice trio of flavors and textures, and maybe more importantly I learned something about world history I had no idea even existed. Brown meat in butter, add onions and green pepper, saute about three minutes. Add tomato sauce along with three-quarters cup hot water and all remaining ingredients (except wine). Cover and cook about one-half hour or until meat is tender. Add wine about fifteen minutes before done. Wash eggplants, pierce with a fork in several places, place in a shallow pan and bake in a 350F oven about 45 minutes or until soft, turning once during baking process. When done your baking dish will have liquid in it – drain this liquid. When eggplants have cooled, peel skins. Put peeled eggplants into a large skillet and mash. Add one-half teaspoon salt, dash of red pepper and one-half cup beef stock (I use bouillon). Mix and heat mixture thoroughly. Place the hot meat mixture in the center of a platter and arrange the eggplant mixture around it. After grating zucchini, squeeze until dry. Add onion, cheese, eggs, salt and pepper. Grease 9″ pie plate. Fill pie plate with mixture and cook 30-45 minutes in 350F oven or until brown. Insert knife. If it comes out clean, it is done.